Politics is awash with terms and phrases that are beloved of commentators and politicians alike. Here is a guide to some of the key terms. A vote cast by someone who cannot reach a polling station. Can be postal or by proxy (see below). A person who represents candidates in their dealings with the electoral authorities and runs their campaigns. Sealed box with a slit in the lid, into which voters place their ballot papers. Paper containing a list of all candidates standing in a constituency. Voters mark their choice with a cross. A vehicle used by a party to transport its leader or other senior figures around the country to rallies or to meet the people. The government's tax and spending plans, outlined once a year by the chancellor of the exchequer. An election held between general elections, usually because the sitting MP has died or resigned. The group of senior ministers at the head of the government. Someone putting themselves up for election. Once Parliament has been dissolved, there are no MPs, only candidates. During a campaign, active supporters of a party ask voters who they will vote for and try to drum up support for their own candidates. When two or more parties govern together, when neither has an overall majority. After the 2010 election, the Conservatives and Lib Dems formed a coalition, which lasted for five years. A smaller party supports a larger party in key Commons votes - specifically confidence votes and finance/supply bills - to keep it in power. The geographical unit which elects a single MP. There are 650 in the UK. A sum of £500 paid by candidates or their parties to be allowed to stand. It is returned if the candidate wins 5% or more of the votes cast. The delegation of powers to other parliamentary bodies within the UK, specifically the Scottish Parliament and Welsh and Northern Ireland Assemblies. The act of ending a Parliament. The argument that only MPs representing English constituencies should decide on laws which only effect England - normally in areas which are devolved to administrations in Scotland, Wales and Northern Ireland, such as health, education and transport. Candidates are only allowed to spend a limited amount of money on their individual campaign. Accounts must be submitted after the poll proving they did not exceed this limit. A list of all those in a constituency entitled to vote. Also known as electoral roll. A poll carried out by researchers asking people how they have voted just after they have left the polling station on election day. Term used to describe the UK's parliamentary election system. It means a candidate only needs to win the most votes in their constituency to win the seat. The right to vote. Now available to those over 18 and on the electoral register. Election at which all seats in the House of Commons are contested. If after an election no party has an overall majority, then parliament is said to be "hung". The main parties will then try to form a coalition with one or more of the minor parties. The name given to an election which one party wins by a very large margin. Famous landslides in UK elections include Labour's victory in 1945, the Conservative win in 1983 and the election which brought Tony Blair to power in 1997. A public declaration of a party's ideas and policies, usually printed during the campaign. Once in power, a government is often judged by how many of its manifesto promises it manages to deliver. Seats where the gap between the two or more leading parties is relatively small. Often regarded as less than a 10% margin or requiring a swing (see below) of 5% or less, though very dependent on prevailing political conditions. A government formed by a party which does not have an absolute majority in the House of Commons. Harold Wilson led a Labour minority government between February and October 1974. Strictly this includes members of the House of Lords, but in practice means only members of the House of Commons. When an election is called Parliament is dissolved and there are no more MPs until it assembles again. A candidate must be nominated on these documents by 10 voters living in the constituency. The official residence in Downing Street of the British prime minister since the 18th Century. Number 10 and Downing Street both serve as terms to describe the prime minister and his or her inner circle, as in "Number 10 has said that". A survey asking people's opinion on one or more issues. In an election campaign, the key question is usually about which party people will vote for. The largest party not in government is known as the official opposition. It receives extra parliamentary funding in recognition of its status. Broadcasts made by the parties and transmitted on TV or radio. By agreement with the broadcasters, each party is allowed a certain number according to its election strength and number of candidates fielded. The offence of impersonating someone else in order to use their vote. Another term for vote or election. Also used as an abbreviation of opinion poll (see above). The person in the polling station who checks the electoral register to verify that the voter is eligible to cast their vote and at that particular polling station. Place where people go to cast their votes. People unable to get to a polling station are allowed to vote by post if they apply in advance. Systems of voting which aim to give parties the representation in a parliament justified by their level of support among the electorate. PR is not used in Westminster elections. The act of ending a session of Parliament. Performed when an election is called. The person responsible for ensuring the conduct of the ballot in polling stations. They have to ensure that ballot boxes are kept secure and are responsible for transferring them safely to the count. People unable to get to a polling station are allowed to appoint someone to vote on their behalf if they apply in advance. They are also allowed a postal vote. The study of voting and voting patterns. The government's legislative programme for the coming session of Parliament. Delivered by the Queen, but written by the government. If a result is close, any candidate may ask for a recount. The process can be repeated several times if necessary until the candidates are satisfied. The returning officer has the final say on whether a recount takes place. A binding vote of the whole country on a single issue. The official in charge of elections in each of the constituencies. A constituency in which the holding party has a big lead to defend. Often regarded as being a margin of 15-20% or more. Famously used by former Conservative Prime Minister Sir John Major in 1992 to address crowds of voters as he travelled around the country. Under the Fixed Term Parliaments Act, a general election is supposed to take place every five years. Theresa May had said she wanted to wait until 2020 for the next scheduled election but changed her mind and called an early - or snap - election, in a move that took everyone by surprise. An MP elected by other members of the Commons to chair debates and deal with the running of the Commons. By tradition, an MP who is Speaker is not opposed by any of the main parties at elections. The attempt to place a favourable interpretation on an event so that people or the media will interpret it in that way. Those performing this act are known as spin doctors. 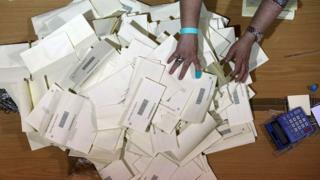 Ballot papers which have been filled in incorrectly. The returning officer has the final say over whether any paper not marked with a single cross is valid. The transfer of votes from one party to another. The actual transfer is complicated, so usually taken to mean between the top two parties in any seat or area. This is when people vote not for the party they really support, but for another party in order to keep out a more disliked rival. In theory, any seat that a party contests and held by a rival is one of its targets. In practice, a target seat is one that a party believes it can win and puts a lot of effort into doing so. Representatives of parties who wait outside polling stations and ask people for their number on the electoral roll. This is to help the parties ensure all their supporters have voted. Tellers have no official status and no-one is obliged to give them any information. The number or percentage of people eligible to vote in a constituency who actually "turn out" to the polling station to do so (or send in their postal vote). When a minority government negotiates support for its policies by seeking the backing of other parties, who would vote for it in the House of Commons. Shorthand term coined to describe a question posed by Tam Dalyell, once Labour MP for West Lothian. Mr Dalyell asks how it is right that post-devolution, Scottish MPs can vote at Westminster on matters solely to do with England, while English MPs do not have the same influence on equivalent issues in Scotland, as they have been devolved to the Scottish Parliament. A term used to describe the hothouse of politics centred on the Palace of Westminster and its surroundings (see Whitehall). A street in central London which is home to several government ministries. Synonymous with the workings of government. Once Parliament has been dissolved, a writ of election is issued for each constituency formally announcing the poll.